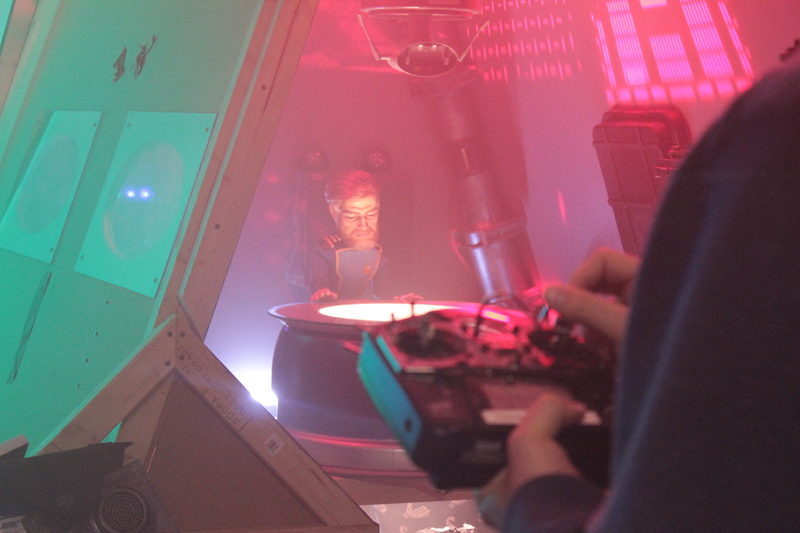 Commander Drew McAllister on set. On Monday 7th March I arrived at a secret location, somewhere on the Slough Trading Estate. My mission: to go behind the scenes on Gerry Anderson’s Firestorm, and bring back some exclusive insights into how the pilot minisode is being made. 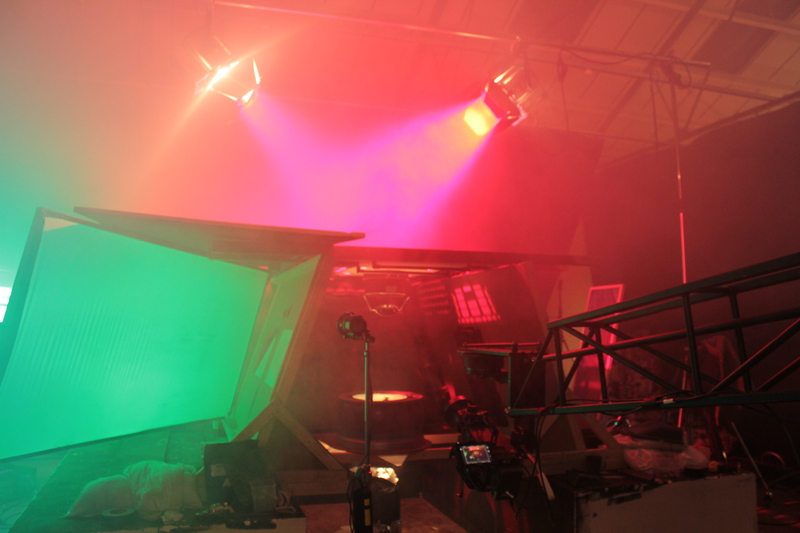 The massive warehouse has been skillfully converted into a studio space with three stages, specially customised for shooting this new Ultramarionation production. 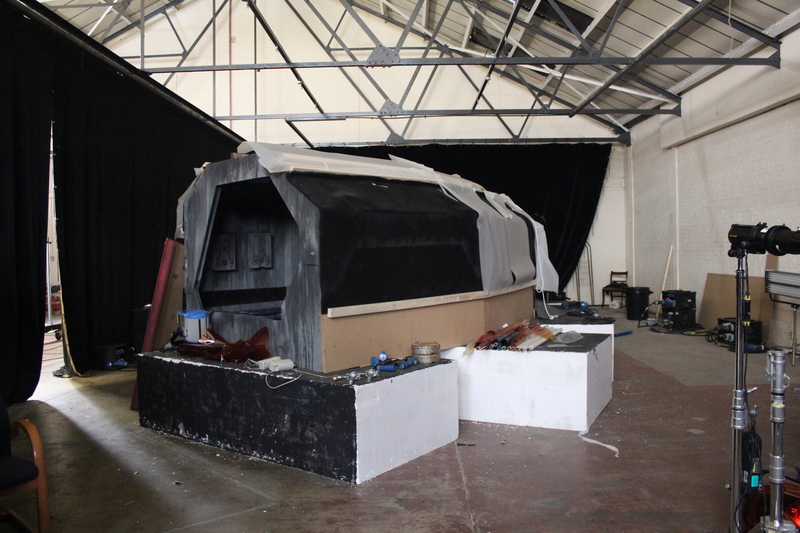 There is also a workshop area where the latest sets are being built at an incredible rate to ensure they are ready for the next scene to be filmed. Part of the enormous corridor set. The sets are truly a sight to behold. A corridor set dominates a large corner of the studio. It’s full of details and superb opportunities for lighting which make it look fantastic on camera. It also has carefully concealed areas for the puppeteers to operate the characters from. The first shot I witnessed saw Sam and Nagisa, the two heroes of Storm Force 9, being hurled away from the explosion of Black Orchid Island which was shot during the previous week of filming. It was my first opportunity to see the Ultramarionation puppets in action and I was absolutely astounded by the achievements of Mackinnon and Saunders who built them. 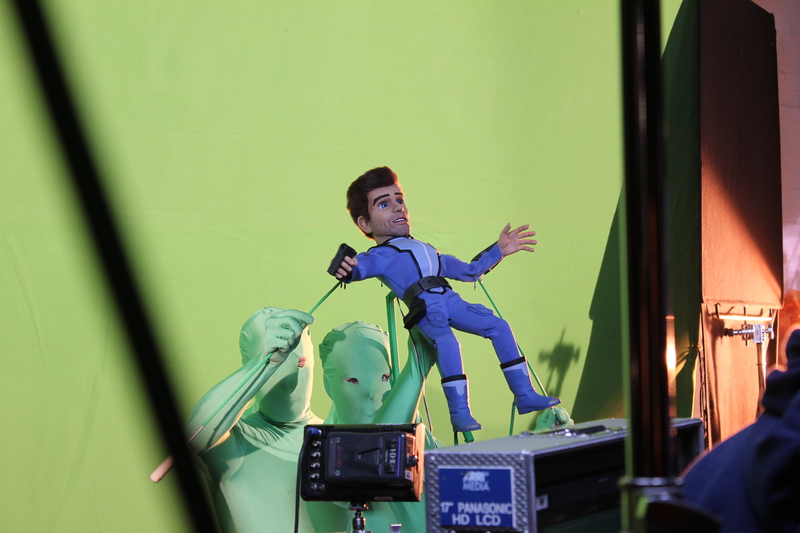 They maintain the aesthetic and proportions of the classic Thunderbirds puppets but with the rod controls allowing a much wider range of movement. The expressions of the face are remote controlled and once again have an incredible range. When the team of puppeteers, led by Andrew James Spooner, bring these characters to life they seem like far more than puppets. They actually feel like actors with their own unique personalities being brought down on to set to give a very real performance. Sam Scott falls from the explosion! After a few pick up shots were done on Black Orchid Island it was back to the puppets and something which I’m sure Gerry Anderson himself never would have considered possible – walking. It takes three puppeteers in special green screen suits to make an Ultramarionation puppet walk and each character moves with their own distinctive qualities like any human would do. Nagisa is prepared for filming. Then it was time to move into a new set. Many hours were spent setting up Commander McAllister’s control room for its first shot. The whole production team came together to rig up a camera crane, light the set and add finishing touches. The detailing of the set, much like on the original Supermarionation shows, was made up of everyday household objects carefully concealed to look like control panels and instruments. The entire studio was filled up with smoke to create a special, moody atmosphere. When everything was finally ready, the puppeteers brought McAllister on to the set and squeezed in underneath to operate him. The dialogue was played back and the lip sync was operated by remote control. After hours of work, the set is ready for shooting. Both during and in between takes I could not help but notice how much McAllister looked like a real actor delivering his lines. Director Steve Begg and Director of Photography Peter Tyler do everything they can in the way the minisode is being shot to make the puppets look like they are giving dramatic performances. All of the crew talked about how comparatively easy it is to make the characters look good on camera and to work with them. The puppeteers give such a polished performance and the technology used to build the characters is so good that the end result is always engaging and keeps your eyes glued to the screen. During my visit I also got to see a number of other models and props being used on the production. These have all been crafted to fit in to this miniature world which both echoes the feel of the classic Supermarionation shows but also brings it bang up to date. Jamie Anderson and his team have done a superb job of capturing what worked so well on series like Thunderbirds and utilising those aspects, as well as many other new and exciting components, for Firestorm. Work on the pilot minisode continues, and I wish the production team the best of luck on completing the shoot, and that their hard work will lead to a bright future for Gerry Anderson’s Firestorm. Previous article Gerry Anderson’s Firestorm Pilot is GO!